you hate to admit it, but lately you’ve been stuck in a negative funk. You feel trapped in a downward spiral and no matter what you do, you just can’t seem to get back to center. You’ve been through tough times before, but this one just seems different and honestly, you’re getting concerned. Your usual quick fixes of yoga or meditation don’t seem to be taking away the growing discomfort inside you. After all the self-help books you’ve read and spiritual wisdom you’ve gained, you hoped you’d be in a better place by now. You’re worried your divine connection is fading and you’ve been feeling kind of abandoned. You feel like you’re fighting a losing battle to keep the pieces of your life in place. As hard as you try to hold on, more things keep cracking and falling away. You’ve been questioning the meaning of your life, all your past choices and the person you thought you once were. Lately, there seems to be a powerful force guiding you along a destined path. You’re open to accept the guidance, follow your intuition and see where it all will lead. You’re ready to finally let go of your fears and find the light in your life again. You’re willing to take a leap of faith and trust in what Life has in store for you. You can feel it deep down, you have a big purpose to fulfill and you refuse to let anything stand in your way. You’ve come this far and you’re not gonna give up now. You’re ready to figure this out and move into the impactful lightworker you feel you’re meant to be. You know your next level is just around the corner and you’ll do whatever it takes to get there. You can’t wait to bust through your barriers and finally live the life you’re being called to live! Hi, I’m Dena Blevins and I was once where you are. I experienced my Dark Night of the Soul back in 2013, right before a massive spiritual awakening. I had no idea what the ‘process’ was called and therefore couldn’t google it or find myself any help. I felt no one understood me and what I was going through and I was certain Spirit had abandoned me. After going through the experience by myself and even considering ending my own life, I decided to teach about the topic and help others move through their own dark night of the soul more smoothly. You can read more of my story here. Are you ready to learn exactly what you’re experiencing and the spiritual reasons it’s all occurring for you now? Are you ready to receive the miracle that’s trying to come through for you and experience your big breakthrough? It’s time to Light Up your Dark Night of the Soul. This 3 part workshop will answer all your questions and help guide you through your dark tunnel at the fastest, smoothest rate of speed that’s perfect for you. Ready to experience what’s on the other side? I am so passionate about helping spiritual seekers navigate through this mystical, yet challenging time, so I have poured my experiences, my heart and my soul into creating this online workshop for you. No one should ever feel lost in the dark like I was and I certainly don’t want that for you! I consider it my mission to help you find gold at the end of your dark tunnel. My story, my process and all my enlightening discoveries! 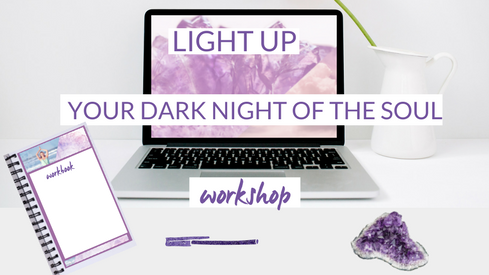 You will also receive a downloadable copy of the Light Up Your Dark Night of the Soul workbook to assist you in busting through your barriers and stepping proudly into your purpose. Are you ready to say YES to your big breakthrough? Upgrade to receive 1 VIP alignment session with Dena to help speed up your breakthrough process. Allow Dena to laser coach you through your unique situation, illuminating the steps you can take to move through your DNOTS with grace and ease. Ask any questions you may have and receive a recording of your session, along with session notes and any action steps Dena suggests you take.